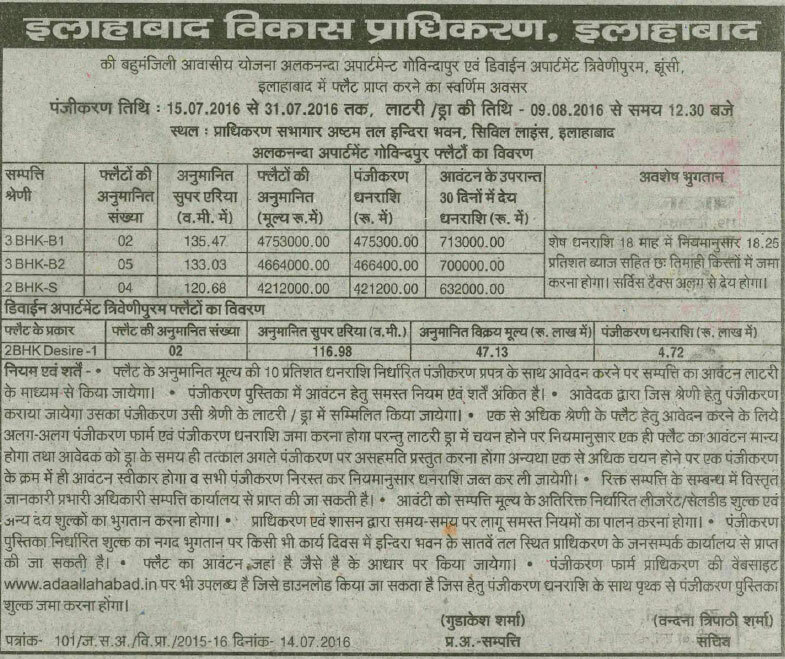 Allahabad Development Authority invites applicants for the vacant flats in ADA Alaknanda Apartments Govindpur and Devin Apartment Trivenipuram housing scheme 2016. Earlier, the authority had invited applications for flats in Alaknanda Apartments Govindpur and Devin Apartment Trivenipuram and allotted flats to the applicants but some flats were left vacant for which the authority again invited applications for the people. Under the scheme, the authority has offering 2BHK and 3BHK flats for allotment. The registration for the scheme has been started from today 15 July 2016 and the last date of application submission is 31 July 2016. How to Apply: The registration for flats has been started from 15 July 2016 and interested applicants can apply for the scheme through offline mode of registration by purchasing the application form Customer Cate office of Allahabad Development Authority Office, 7th Floor Indira Bhawan. It can also be downloaded from the official website of ADA Allahabad at http://adaallahabad.in.